File support (via USB): Supports WMA, MP3, ACC, WAV and FLAC files. MPEG4, WMV, H.264, DivX, DivX Home Theatre 3.1, MKV and FLV video. JPEG Images. Bluetooth Audio. Other music devices via the auxiliary input on the back. Supported Functions (Handsfree): Phone book transfer. Music playback time. Siri Eyes Free. Display: Capacitive 6.2" (15.75cm) WVGA multi-touch display. GPS (External GPS Antenna included): The GPS Antenna provides accurate positioning, even if the phone in the vehicle has poor reception. Accessories: External GPS Antenna, Handsfree external microphone. USB: 2 x USB inputs back. iPhone direct control via USB: iPhone 4 (Optional cable CD-IU210N required). iPhone 5 (USB to Lightning cable CD-IU52C & Apple Digital AV Adapter required. RCA Pre: 3 Preamp outputs (front, rear and subwoofer). Equalizer: 13 band graphic equalizer. Compatible with iPhone 5S/5C with iOS 7 (via HDMI). iPhone 5 with iOS 6 and iOS 7 (via HDMI). iPhone 4/4S with iOS 5, iOS 6 and iOS 7 (via USB). iPod Touch 4th generation with iOS 5 and iOS 6 (via USB). Supported functions: Access to photos, calendar, contacts, podcasts. Video playback. Music playback time. Charging function. Compatible with certain Android smartphones with HDMI or MHL. Cable required CD-AH200. 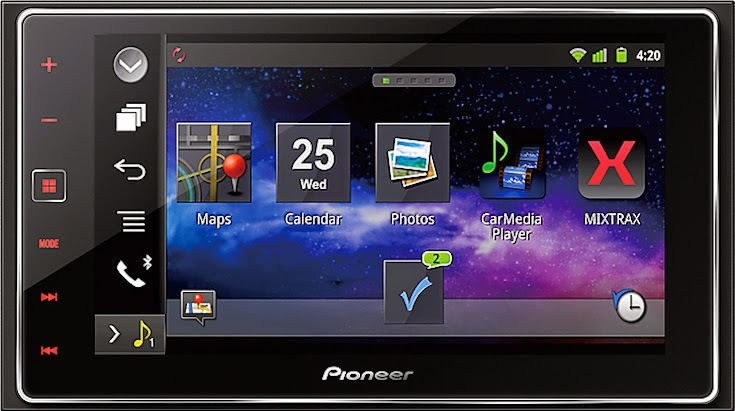 The list of compatible Android smartphones can be found on Pioneer's website. The user manual of the SPH-DA120 can be found here. So are we back to not having CD/DVD playback? It's like AppRadio2 all over again! People still use CDs? What is this 1995? I'm assuming that if you're buying an AppRadio you're thinking of using your phone apps with it, including the music apps built into the various Android/Apple devices.